When talking about how to hit irons, one of the simplest ways to improve your golf game is also the most obvious: Know your distance. Know how far you’re hitting the golf ball. Now, you may be thinking that this advice is not only obvious – it’s also inevitable. You can see the flight of your ball. You can probably tell me how many shots were too short in your last round. And you certainly remember the drives that went exactly where you wanted them to. How is it possible to not know your distance? Well, what I’m talking about is exact yardage. I can’t tell you how many students come to the Todd Kolb Golf Academy with no idea how long their drive is. One of my first priorities as an instructor is to make sure they know their distances. Until they have those numbers, they cannot recognize patterns, test their consistency, and improve their game. The same is true for you. And to get started, you need to have the proper tools. When learning how to hit irons more effectively, the most helpful statistic is knowing the distance you actually hit each iron. 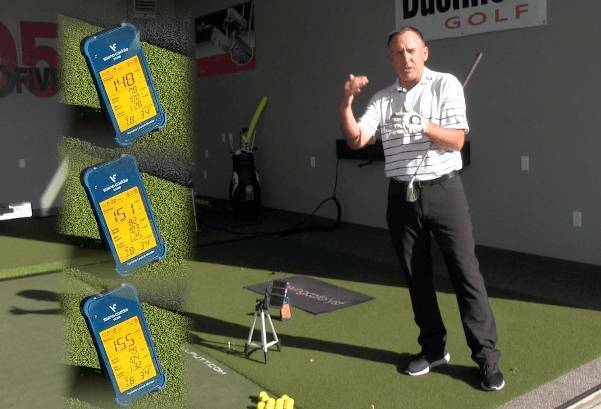 The surest way to know your exact distance is by using a launch monitor. A launch monitor is a device that measures what happens at the moment of impact and during ball flight. More specifically to our purposes here, a launch monitor measures exactly how far your ball goes. At my golf academy, we use the industry standard launch monitor. This is a stationary device costing upwards of $15,000. 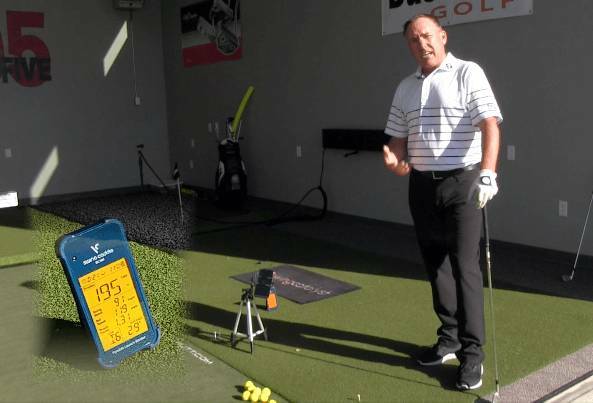 Our launch monitor is a worthwhile investment for the academy, but it isn’t practical for the average golfer. An affordable, portable alternative is Voice Caddie’s SC200, also known as the Swing Caddie 2. For a device that’s less expensive and more convenient than our unit at the academy, the SC200 is surprisingly accurate. 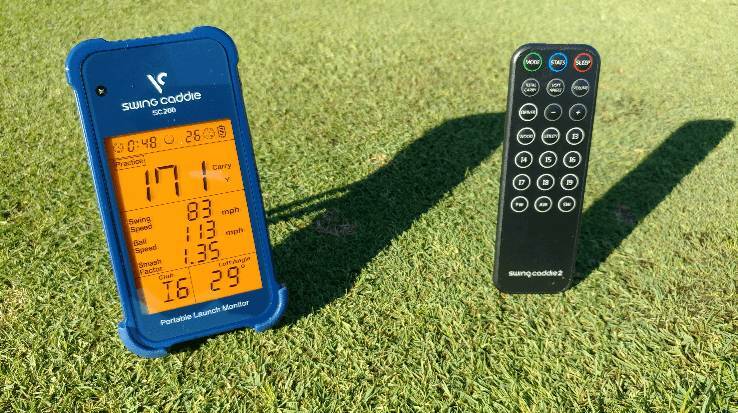 Voice Caddie’s device provides readings that are nearly identical to our industry standard launch monitor. For this reason, the SC200 is my first choice for when I’m practicing out on the golf course. What is the Swing Caddie 2? The SC200 comes ready to use – all you have to do is put in some AA batteries and turn it on. Set the device up on the ground behind your ball. The SC200 comes with a remote control. This enables you to change the settings from right where you’re standing. Set the unit for the club you’re using. If necessary, you can even adjust the loft angle to match your club. Then take your shot. The unit will show you your stats immediately after each swing. There is even a Voice Distance Output feature that reads the yardage out loud. This way, you can keep setting up your shots and swinging. No need to stop and look at the screen. So, now you know how to find out your distances, but what do you do with that information? I performed a field test with my own SC200 unit to show you how to interpret those numbers and use them to improve your golf game. Now, typically you’d want to hit 10-12 shots before you analyze your distances. When figuring out how to hit irons, having a larger sample size will net a better average. Three drives are not enough to get a clear sense of your average distance. But for the sake of simplicity, we’ll just analyze these three readings. One thing I noticed right away was the disparity between these numbers, especially between my first and second shots. If I were judging these distances based on the look and feel of the drives, I might underestimate this disparity. Each shot felt just about the same as the shot before. However, I do have the exact yardage for each shot. As a result, I am able to see that I am averaging about 151 yards on my 8-iron with a variance of four yards. I can also see that there is a disparity of seven yards between my shortest and longest drives. I’d like to tighten up that gap. In practical terms, that disparity is the difference between reaching the pin and overshooting the pin by 4-7 yards. Now, you may have noticed that the first thing I did to examine these numbers was determine the average. It is always important to look at your averages when evaluating your distance. You cannot judge your abilities by your best or worst drives. You need to know your average to accurately evaluate your consistency. How close are your longest and shortest shots to that average? When you look at your last ten shots, does it seem like you’re regularly shooting close to that average? Or are those yardages all over the place? Let’s suppose the SC200 is giving you nothing but good news. What do you do with that information? After running a test with my 8-iron, I switched to the 6-iron. Once again, I changed the club settings on my Swing Caddie 2 using the remote control. I was surprised by the distance on my first swing, because I don’t often hit a 6-iron quite that far. My second swing felt like the golf ball wasn’t going to go as far as it did on the first shot. However, thanks to my SC200, I was able to see that it actually went farther. Now, when I look at all three of these numbers, I see that my average distance on the 6-iron is 194 yards. I also see that I have a variance of only two yards. In other words, I’m keeping the disparity between shots much tighter than I did on the 8-iron. That was great to know! It was also great to see that I shot farther than I usually do with this particular club. Because I’d been using the SC200 regularly, I knew my average distance, and I knew that I had just exceeded that average. That knowledge helped me evaluate the way I was playing on this particular day. What was different? Was I making progress, or was there another factor at play? In this case, my shots felt really solid, so it may be that I was simply having an “on” day. I also may have been seeing the benefits of my new fitness routine. However, another thing I noticed was the weather. At the time of these really solid drives, I was shooting downwind. So, the wind may have carried my ball a little farther than usual. I realize these may all seem like tedious details. Regardless, the more information you have about your shots, the easier it is to evaluate yourself and your environment. If you know how you’re playing and how your environment might help or hinder you, you know what to work on. You know how to prepare. You can start playing better golf. Now that you know how to evaluate your distances, let’s talk about how you can train to improve them. In the field test I described above, I was using the Practice Mode on my SC200. Practice Mode is the basic mode that reads and stores your stats for each swing. The SC200 also features two other modes that can help you work on improving your distance. The first is Target Mode. This setting enables you to set a target distance. Then, when you take your swing, the SC200 gives you your stats and scores you based on how close you came to hitting your target. 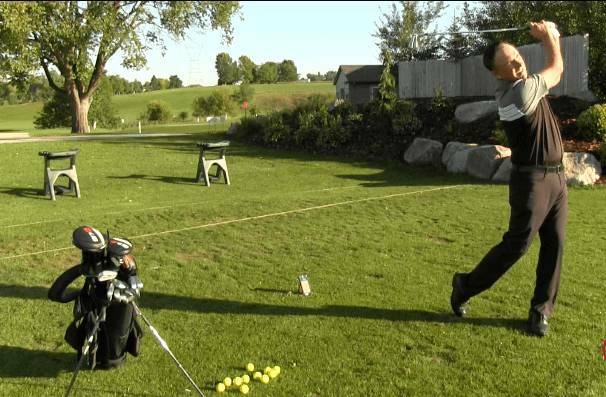 This can be a great way to work on increasing your distance or improving your consistency. Another option is Approach Mode. In this setting, the SC200 selects a new target distance for every swing you take. Just as with Target Mode, Approach Mode awards you points based on how well you do. This feature is good for distance, consistency, and flexibility. No matter how you choose to use it, the SC200 is a great tool to help you evaluate and improve your swing. And it all begins with knowing your distance. Knowing distances is essential for every golfer, from the amateur who first picked up a club last week to the PGA champion. This information can help you discover weaknesses and strategize your practice time. It also helps you realize when you have something to celebrate. Progress happens slowly. You might not realize you’ve picked up another five yards in your average without a launch monitor to tell you that. I’ve been golfing for years. I know what a solid shot feels like. I have a good eye for distance. Yet, I still like to keep my Swing Caddie 2 out on the golf course with me so I can track my exact distances. No matter how good you get, a launch monitor is a tool you will never outgrow. Here’s a quick cheat sheet for all the information we’ve covered. If you want to see your scores go down, start by finding out how far you’re hitting the golf ball. To check your distance anytime, anywhere, invest a in a portable launch monitor. Voice Caddie’s SC200 is a reliable, affordable option. The SC200 gives you readings for your clubhead speed, smash factor, ball speed, and distance. It also comes with a remote so you can switch between modes and clubs without picking up the device. Use your SC200 to check your distances regularly, measuring your distance for several shots in a row on the same club. Evaluate yourself by determining your average distance. Make note of the disparity between distances. If you’re surprised by the numbers, ask yourself if you’re doing something different or if there might be any environmental factors at play. Once you recognize patterns in your distance, use the SC200’s Target and Approach modes to practice. These modes are designed to help you challenge yourself. Target Mode allows you to select a goal distance. Approach Mode randomly chooses a variety of goal distances for you. And of course, once you start measuring your yardage, never stop. No matter your skill level, knowing your distance is always key to mastering the game of golf. 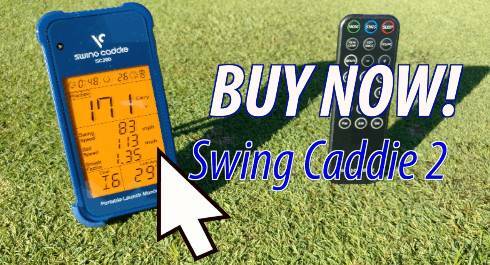 BUY A SWING CADDIE 2 TODAY! Have you tried this yet? Are you already tracking your distance? If so, how has it helped your game? Do you have any questions or counterpoints? Please share with us in the comments. We’re always happy to hear from you! If you’re curious to know more about the SC200 and how you can use it to become a better golfer, stick with us. The Swing Caddie 2 has many more uses than we can list here, but we’ve got you covered. Look out for more videos and articles with advice on how to use the SC200 to enhance your golf game and get those scores down. Next post: What is The Skill Code?